Mickey Mouse and Disneyland are part of the fabric of the American experience. In the 21st Century, few young people know what the Baby Boomer generation understands without explanation: the name Disney is more than a corporate logo. Walt Disney Family Museum sets out to chronicle the life and achievements of Walt Disney. It doesn't present a history of the corporation or provides Disney-style entertainment. In fact, the museum is entirely separate from the company that bears the Disney logo. The Disney Family Museum is not a "Disney" museum full of cartoons and rides. Instead, it tells the story of a man who was first and foremost a storyteller himself. If you don't want to hear about Walt Disney all day and learn about his life, this place isn't for you. On the other hand, if you'd go positively giddy watching some of Disney's earliest short films. Or feel faint while seeing one of the original multiplane cameras used to make ​Snow White and the Seven Dwarfs. Or be happy reading this animation note for the seven dwarfs: "Dopey: Droopy effect in all clothing,” then this is the place for you. The museum's ten permanent galleries are in chronological order. Exhibits bear the distinctive Disney style and include the earliest known drawings of Mickey Mouse and a specially commissioned, 12-foot-diameter model of the Disneyland of Walt’s imagination, with attractions he developed himself. There are moments of "wow" when you're looking at a wall of still drawings and realize that a few of them are actually moving. Or you might be looking at camera effects technician Herman Schulties' 1939-1939 notebook (which is cool enough) and realize that the screen next to it lets you browse through every page, digitized and augmented with matching film clips. You can experience the museum in many different ways. If you live nearby, you may want to do just that. Make one trip to follow the life story of an extraordinary man. Go back to look into the history of animated film production, listening to the tales of people who worked on the famous projects. And again to find your own threads to follow and investigate. Perhaps the most telling comment about the Walt Disney Family Museum came from a fellow Baby-Boomer who visited with me: "It brought up memories I didn't even know I had." If you arrive in the morning, you're likely to be still having a great time when lunchtime rolls around. You'll find a small cafe downstairs serving sandwiches, salads and the like. Service animals are allowed inside, but other pets are not. There's no place to board them nearby, so it's best to leave Fluffy at home. As frustrating as you may find it, no photographs are allowed inside the museum. Real fans can take a long time to go through the museum, and it's short of places to sit and rest your feet. Wear your most comfortable shoes. While it might appeal more to baby boomers who enjoyed watching Walt Disney's television programs, the kids will enjoy the cartoons and some exhibits. However, they might grow restless while the adults spend too much time reading every one of the many informational panels and reminiscing about their favorite Disney moments. You know your kids, and please be courteous to other museum-goers by finding someplace else for them to go it they're likely to be disruptive. Also, keep in mind that strollers aren't allowed, and there are few hands-on exhibits for the tactile-oriented child to enjoy. If you're curious, the Disney Family Museum is in ​San Francisco because Disney's daughter Diane Disney Miller lived near San Francisco. She thought the Presidio would be a perfect place for a museum dedicated to her father. However, it is curious that a museum about a man who lived and worked in Southern California is in San Francisco. It's best not to speculate too much and instead just enjoy the place. Check current prices and hours at their website. Allow at least half a day, longer if you love Walt Disney and his creations. You can visit anytime, but weekdays are less crowded. The Presidio is near the Golden Gate Bridge. Set your GPS or maps app to find 104 Montgomery Street or drive into the Presidio and look the distinctive row of red-brick barracks buildings. You'll find a public parking lot right in front of the museum and another behind it, but you have to pay to both of them (and the few parking spaces on the street). The Presidio public transit center is very near the museum entrance. San Francisco Muni routes 28 and 29 go there. Transit 511 will help you figure out how to get there from wherever you start in the San Francisco area. 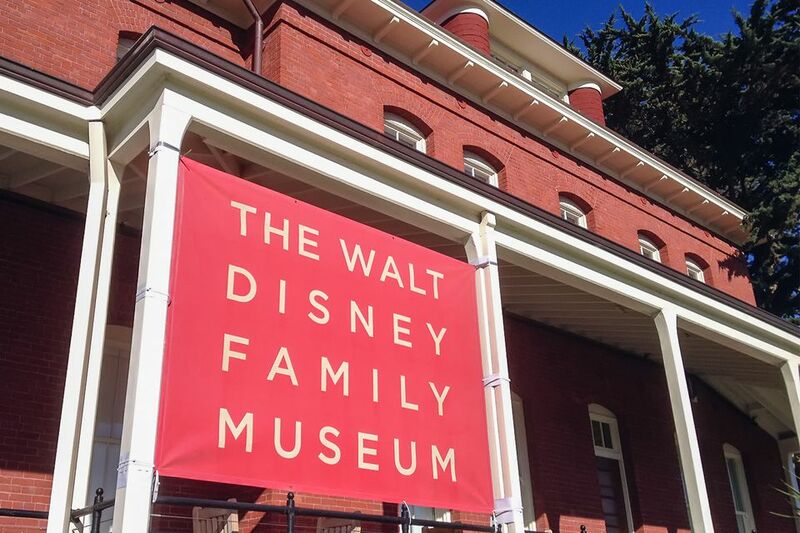 As is common in the travel industry, the writer was provided with complimentary tickets for the purpose of reviewing the Walt Disney Family Museum. While it has not influenced this review, TripSavvy believes in full disclosure of all potential conflicts of interest.